The Mt. 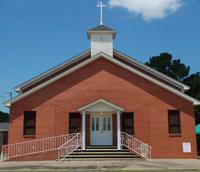 Gillard Baptist Church was founded in 1820 in Trickum, Al, now known as White Hall. The church was controlled by a white population from 1820 to 1875. Because black people were not given the privilege to mingle with whites, blacks sat in the rear of the church during church services. As time passed, many of the older whites died and the membership began to decrease. Because of this decrease, a new location was considered and the decision was made to move the church to Benton, Alabama. The white membership gave the black membership five (5) acres of land which is where the current church building sits. Initially, there was no building on the current site but the blacks unified to build a “Brush Harbor” to have services. This building was given the name “Little Mt. Gillard Baptist Church.” This name was used so that people could distinguish between the black church and the original Mt. Gillard Baptist Church. As time passed, the membership grew for Little Mt. Gillard. Because of the growth in membership, a new wood frame facility was built. The cornerstone is dated for 1901 with Rev. B.F. Braxton as Pastor. Some of the deacons were John Moorer, Gil Robinson, Ed Forester, D.B. Johnson, and Kia Murry. Pilot Creek was used for baptisms until somewhere around 1928 or 1929 when the current baptismal pool was dug. Rev. Tom Caney was the Pastor during these baptisms. Listed (not in order in which they served) are some of the Pastors of this church: Rev. Braxton, Rev. Tolliver, Rev. Herrod, Rev. Odum, Rev. Jack Fisher, Rev. Byrd, Rev. Harvell, Rev. Patterson, Rev. Simmons, Rev. O.T. Harvey, and Rev. Tom Caney. Rev. Theodore Roosevelt (R.V.) Harrison became the pastor in 1943 and served for 42 years. Under his leadership, the church was able to accomplish many great things. In 1950, members bricked the wood frame building. Deacon Napoleon Mays assisted in this project. The renovations were completed in 1966 at which time a new cornerstone was placed. Deacons at the time were Sam Whatley, Mitchell Maull, Lemon Maull, (Board Chairperson) and W.C. Haralson, (Church Clerk). During this period, the name of the church was changed to “Mt. Gillard Baptist Church.” An annex housed the kitchen and restrooms. In 1974-1975, new pews and carpeting were installed in the church. In 1983, the city water service was added and a speaker system was purchased by the choir. A stove and cabinets were purchased by the Sunday School and B.T.U. In 1984, the church began to have services two (2) Sundays each month. Because Rev. Harrison was the full- time pastor of another church in Montgomery, AL, the church and Rev. Harrison reached an agreement for him to provide a minister for the second Sunday services and Rev. Harrison would continue to preach on the fourth Sunday of each month. Rev. Abraham H. Moore was chosen to carry out this task. Shortly thereafter, Rev. Harrison became ill and was unable to fulfill his responsibilities. Rev. Moore was asked to preach both Sundays and was appointed by the church to serve as Assistant Pastor. In May of 1985, Rev. Harrison died and after observing a sixty (60) day period of mourning, the church asked Rev. Moore to serve as full- time Pastor. He accepted the position and served in this capacity for eight (8) years. In honor of Rev. Harrison, the church continued to implement the renovations that were underway after his death. On May 31, 1987 the church renovations, estimated at a cost of forty- two thousand dollars ($42,000.00), were authorized and completed through financial assistance from People Bank in Selma, AL. The note of thirty thousand dollars ($30,000.00) was scheduled to be paid in full August 2002, but through the grace of God the loan was paid in full five (5) years early. During the renovations, Mt. Gillard held services at the City Hall, in the Town of White Hall. Renovations included new walls and ceilings, extended front, and the relocation of the bathrooms to the front of the church. The renovations also included new lights, ceiling fans, stain glass windows, carpeting, and central heating and air. Renovations were completed by Wagner and Bandy Construction Company. Pastor McQueen tendered his resignation June 2011.